But Oslo is chasing only one kind of gold: tourism. And this is the Oslo travel guide to help you make the most of yours. Like its Scandinavian neighbors, Norway has a reputation for being expensive—but you’ll really only notice this when you dine. Luckily, you can get affordable accommodations that, combined with your cheap airfare, offset the steep dinner bills and bar tabs. I promise: In the grand scheme of things, you’ll leave Oslo feeling like you beat the system, even if you ate and drank like a Viking. All signs point to The Thief Hotel at the tip of Thief Island in futuristic Aker Brygge. This might make the hotel seem far away from everything. It isn’t. Oslo is extremely walkable. The Thief is a charming five-minute jaunt from the hub of boats and bus lines, and a few minutes more from Oslo Central Station. 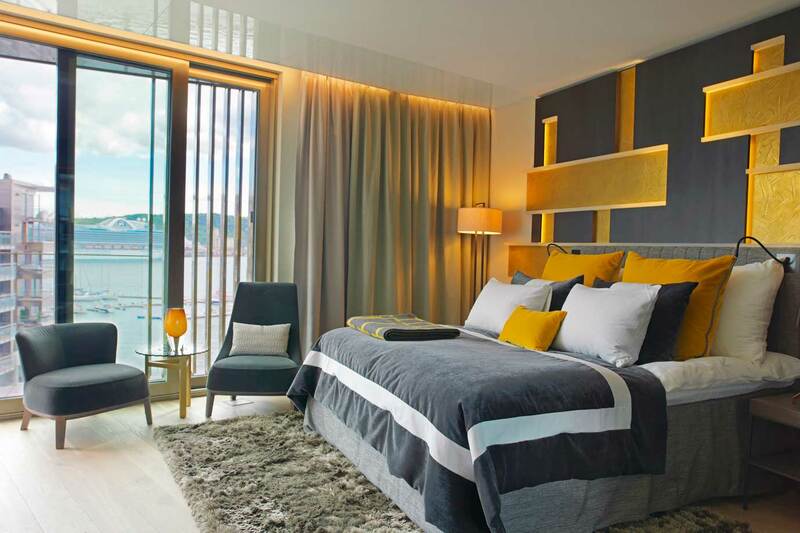 A Thief reprieve gives you fjord views, five-star cush accommodations, the biggest and freshest breakfast buffet you’ve seen, an onsite gym, spa, and fitness center, plus the coolest rooftop restaurant and bar in town—with panoramic views of the city and fjord. The hotel is three paces from the Astrup Fearnley Museum of Modern Art, which boasts an impressive collection of works: Damien Hirst, Jeff Koons (specifically Bubbles and the gold porcelain Michael Jackson), Takashi Murakami, and Cindy Sherman. Oh, and museum entry is free with your Thief room key. If you’d prefer a more b-and-b-style stay, look west to Frogner House Apartments, outfitted in Scandinavian swag and scattered throughout the city. They’re as small as studios or as big as three-bedrooms, and have full kitchens. They also offer add-ons like breakfast and airport transfers, if you’d rather not juggle those. Your visit is charming from the start: After checking in, take the public ferry in Aker Brygge (the #B4 to Gressholmen Island, leaving every half hour), and enjoy your first meal right at Gressholmen Kro. Try to get there by 7 p.m., so you have plenty of time before they close at 9. Start with the shrimp and mussels before your chicken or cod entrée. It’s all fresh, seasonal, local…Norwegian, really. Catch the boat back to Aker Brygge, and get a nightcap at the Thief Roof Bar or its indoor cocktail bar, open til 1 a.m. Your fresh Norwegian fare continues with breakfast at the storied Grand Oslo Café in the city center, which is worth bookmarking for lunch and dinner, too. Then catch the #30 bus west to Bygdøy, to the Norwegian Folk Museum and its open-air exhibitions on Norwegian history and culture. That makes it a nice companion to the Norwegian Museum of Cultural History, which exhibits indigenous art, a medieval gallery, and Viking artifacts (like the only known fully preserved helmet). Speaking of Vikings, your entry to the Cultural History Museum includes entry to the neighboring Viking Ship Museum. 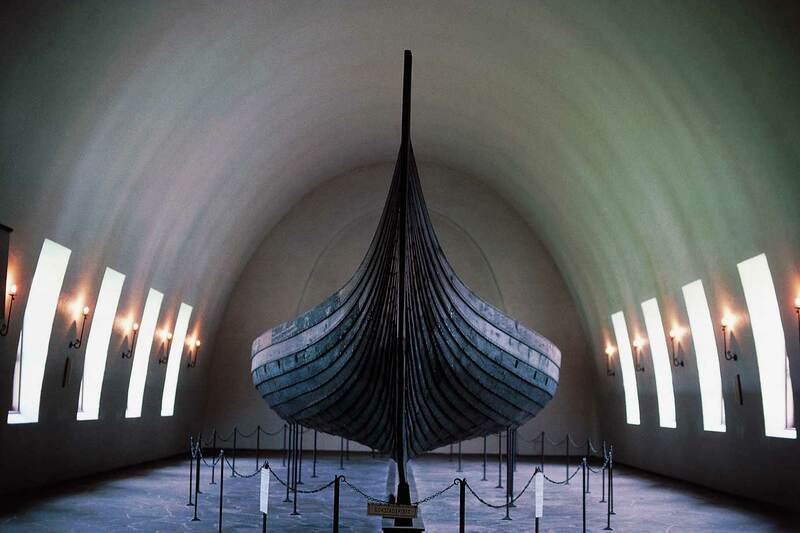 The centerpiece is a preserved Viking ship, which dates to the 900s. You can also see an excavated ship, study the Vikings’ woodwork, and watch a ceiling-projected film about the history of these bearded craftsmen. Stop for a hamburger lunch at Kongen Marina on your way back to the city center, but save room for your impending early dinner. Freshen up at the hotel, then walk to Ett Bord for an early dinner. “Ett bord” means “one table”, and that’s the premise: It’s an osteria-style, Viking-sized table at the center of this eatery specializing in fresh and seasonal fare. (Notice a trend for your weekend dining?) You’ll befriend your neighbors and experience true Norwegian hospitality—that is, warm and bright—with fresh salad, chicken, or cod as a bonus. Tonight you’re heading to Den Norske Opera & Ballett, (you’re intuitive enough to know that it’s the Opera and Ballet). It’s the decade-young architectural wonder on the waterfront, so get your panoramic photos on the rooftop while you’re there. Check the calendar in advance to secure your tickets to whatever is showing, since most weekend performances sell out in advance. They often start at 7 p.m. and run until 10 p.m. or later. Get a nightcap at the cozy, lush Torggata Botaniske—I suggest the Blackberry Bramble or a cold pint. Get yourself to Mathallen for fresh farmers’ market-style breakfast—pick from dozens of vendors—then spend a few hours perusing the shops and side streets of Grünerløkka (the neighborhood where Oslo’s younger, hip crowd lives and plays). If you need a haircut, duck into Pelspels Markveien, then dust off your duds a couple doors down at Dapper. (A great Norwegian souvenir would be a permanent Scandinavian influence on your personal style). You’ll be back in Grünerløkka later tonight, but for now it’s time to head back towards the waterfront. Grab a late lunch at Vippa Food Hall, which features vendors from various countries around the world—namely refugees who have opened shops featuring authentic cuisine from their homelands. I had fantastic Ethiopian injera, and my brother devoured his Syrian haloumi platter without pause. You’ll be a few pounds heavier, but there’s no beach body necessary for sauna. 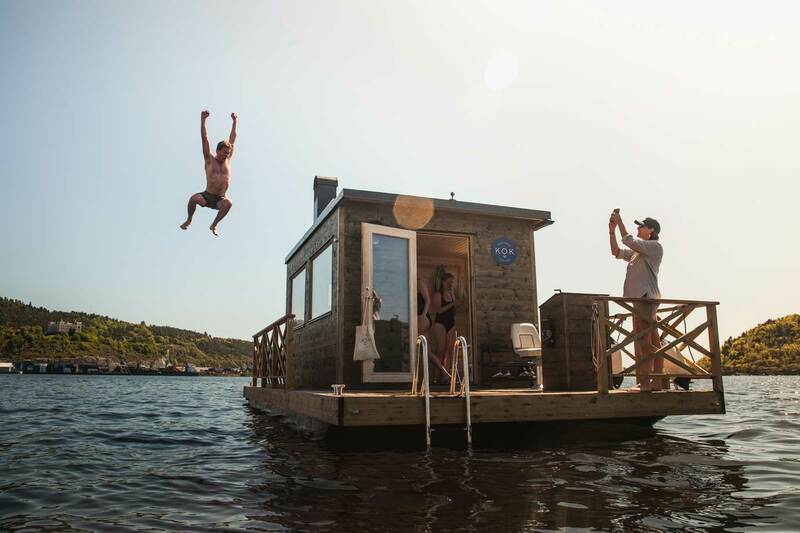 And I’m not talking about any typical sauna here—you’ll spend the afternoon on a floating sauna boat that cruises out into the Oslo Fjord. Rinse off before dinner at the relaxed Sentralen Restaurant—not that they would turn you away for wearing a dry swimsuit and t-shirt. It’s located inside the Sentralen Cultural Center, which might have some live music happening simultaneously. Get breakfast at the hotel/BnB, then skirt over to the Nobel Peace Center in Aker Brygge; It opens at 10 a.m. Every year, Oslo hosts the Nobel Peace Prize ceremony, and the center features rotating exhibits that examine modern culture. (One exhibit focused on society’s collective fascination with becoming wealthy, and the consequences therein). There’s also an exhibit on the most recent Prizewinner’s topic (the effects of nuclear weapons, for example), plus an interactive room that showcases all previous prize winners and their noble efforts. This is going to differ based on the time of year you visit. I suggest you visit one of two sculpture parks. Sculptures pepper the city, but two major parks house fantastic collections and grounds. I’d first recommend Ekebergparken, which rises 130 meters above the fjord in the east corner of the city, with art scattered around the forested, hilly park. You want to go at this time of day, primarily because the best installation, James Turrell’s Skyspace, only allows visitors between 11 a.m. to 4 p.m. on Sundays. Send them a request for your own visit, just to be sure you can secure a spot on their calendar. You’ll also find works by Marina Abramovic (her “Scream” is curiously interactive and surprisingly cathartic), plus others by Damien Hirst, Auguste Rodin, and Salvador Dalí. 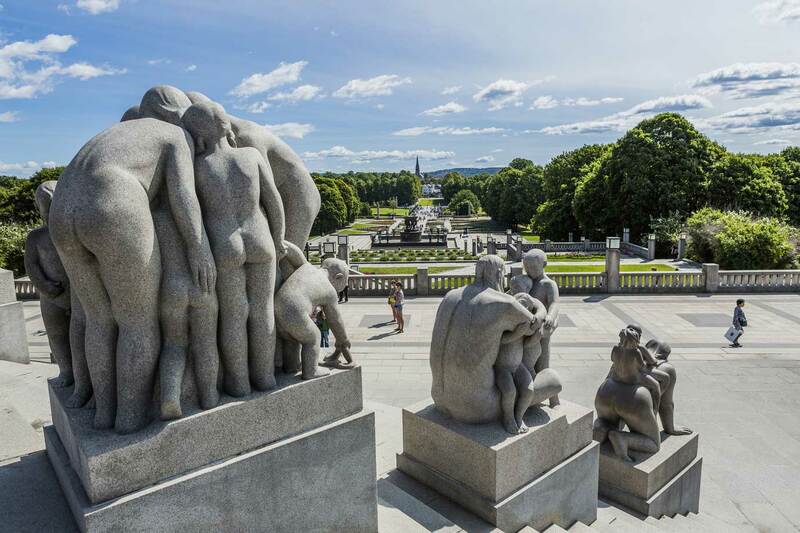 The other option, the Vigeland Sculpture Park in Frogner, is more popular with tourists. It features 200+ works from sculptor Gustav Vigeland, who helped design the beautiful grounds as well. I suggest you take advantage of the northern latitude, and indulge in some outdoor athletics. First, there’s the obvious—skiing at Oslo Winter Park, open from December through Easter. 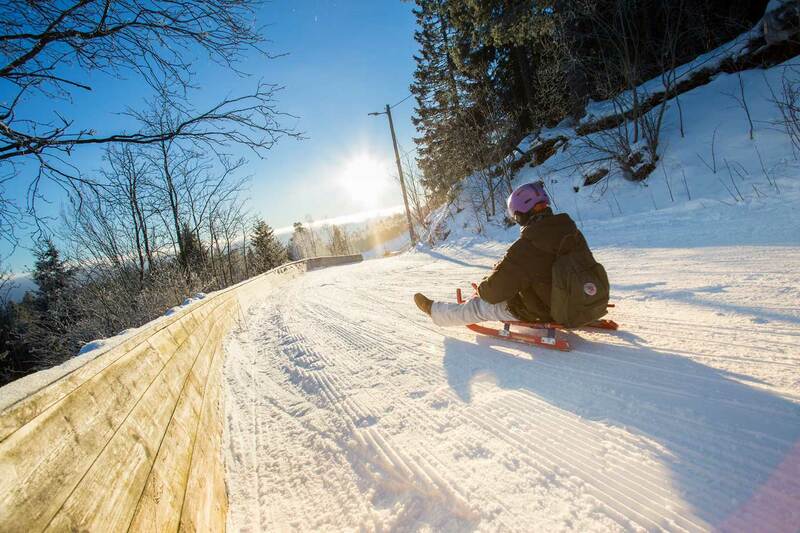 You can also try tobogganing nearby at Korketrekkeren, a famous run that falls 255 meters over its two-kilometer route. But if you’re less ambitious (I say that proudly), try ice skating at Spikersuppa in front of the parliament building, or at Frogner Stadium in Majorstua, both open between November and mid March. They’re open til 9 p.m., which works nicely with your cocktail crawl to Andre Til Høyre (open til 1 a.m.) and HIMKOK Cocktail bar (where you can close down at 3 a.m.). We kept you up late on a Sunday, so your Monday morning (and final one) is far from taxing. Plus, most of the city’s museums and restaurants are closed for the day. If you need a final Nordic meal, then fill up at Grilleriet, near last night’s dinner and cocktails. As for activities, take it easy with a stroll around the city center and waterfront, so you can bottle it all up—and note a few extra landmarks you may have missed. Plug these into your maps and walk among them—Norway’s Royal Palace in Slottsparken, the Oslo Cathedral, Storting Parliament building, and the sleek, futuristic Barcode Project neighborhood just past the Opera House (Barcode replaced a portion of the formerly industrial waterfront).